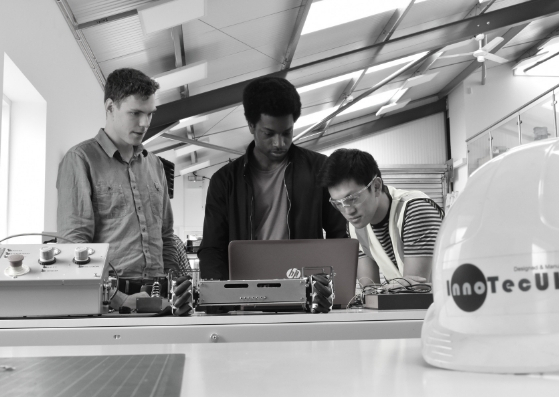 As a fast-growing and progressive robotics and automation SME, we understand the challenging yet rewarding practises that lead to the development of new skills; as such, at InnoTecUK we continue to invest in programmes and initiatives towards helping not just our people, but persons passionate about learning and developing new skills, which will in turn help us to develop world class robots. This year, we welcomed Clinton Igwegbu, Matthew Pengelly and Rory Xiao from Cambridge University into our Projects team all keen on learning and developing new skills to further develop their professional career. At InnoTecUK, we share a relaxed, inspiring and supportive working environment. Through our team of experienced and enthusiastic engineers we promote instant real work mentoring and encourage our people to take ownership of projects. This is achieved with constant team and leadership support. Our projects are highly multi-technical, providing the opportunity for graduates and interns to further develop technical skills through hands-on experience. Visit our careers page for opportunities with us. “Interning at InnoTecUK was a broad and fulfilling experience as we (the interns) undertook our own project, allowing us to have a ‘taste’ of each phase of the design process. This greatly increased my oversight of the robotics industry and I thoroughly enjoyed the experience. What’s more, working at a start-up freed me from the rigidity of a large corporate structure, giving me more freedom to pursue my interests…” Clinton Igwegbu. “It was great to be able to work on a semi – independent project with the other interns, which gave us plenty of interesting design to do, while being supported by InnoTec’s engineers…Working in the professional environment of InnoTecUK was a very valuable experience which will definitely help me in my future endeavours”. Matthew Pengally. “The engineers and employees were all extremely friendly and made me feel very welcome. I gained a lot of useful knowledge from talking to the engineers, both in terms of career advice and technical knowledge. All the employees were more than willing to offer help with our project, and lend their expertise, even during the busiest of times. The regular pub socials became one of the highlights of my week and helped to promote a sense of comradery amongst the employees, which I enjoyed greatly. It would be great to stay in contact with the people I have met here at InnoTecUK”. Rory Xiao. We wish Clinton, Matt and Rory all the best in all they set out to purse!